47 Caledonia Road corner of 370 Crown Street, Glasgow. S.S. 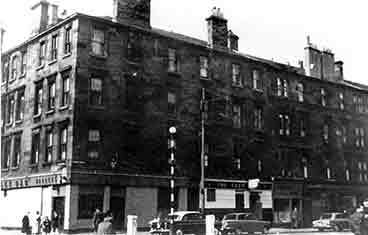 The Caley Bar, image taken from Caledonia Road looking up Crown Street. Thanks to Norrie McNamee. There has been a public house on this site since 1859. The first licensee was spirit merchant Robert McCormick. He lived with his wife and family at nearby 287 Crown Street. Mr McCormick traded from here until 1872. The next licensee was George Duncan, a wine & spirit merchant from Caledonia Road (Caley Road). 1873 to 1889. George Fisher was next on the list of licensees 1889 to 1891. Over the years many spirit dealers have come and gone including James Dunn 1892-1904, James paid an annul rent of £80. William Hunter from 1905 to 1927. William Davidson from 1927 to 1933. And one of the most famous publicans was Thomas (Tommy) Milligan. Tommy Milligan was not just a great publican he was also a Champion Boxer. Tommy Milligan b02/03/1904 d17/12/1970, was born in Shieldmuir, Wishaw. 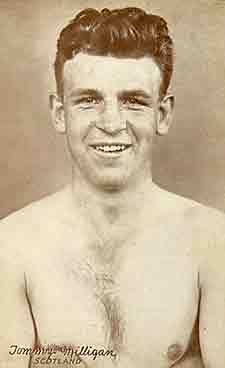 He was the Scottish Professional Welter/middleweight boxer of the 1920s, who won the Scottish Area welterweight title, the British Empire welterweight title, European boxing British middleweight title. Many of his fans frequented the pub which was known by the locals as Milligan’s Bar. 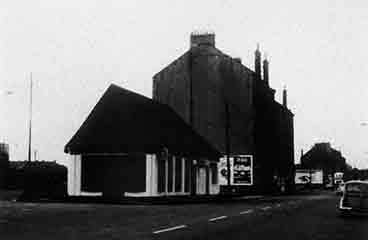 Tommy opened another pub at 236 Dalmarnock Road, The Gushet House at the corner of 123 Old Dalmarnock Road. The Gushet House, corner of Dalmarnock and Old Dalmarnock Road. Thanks to Gordon Adams for the image. After Tommy Milligan James G Angus took over on behalf of the West of Scotland Taverns Ltd. He was also licensee of pubs at 382 Argyle Street (the Kendal), 641 London Road (the Station Bar) and 980 London Road (the Wee Ship). In 1969 George Laird was licensee on behalf of Tennent Caledonian Breweries Ltd.